Andy Lau gets fired up in On the Wrong Track. 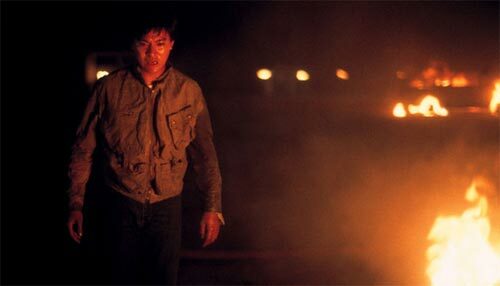 The Skinny: This tale of disaffected youth from Clarence Fok features Andy Lau in an early starring role. Although both director and actor show glimpses of the talent they will display in later projects, the film itself is thrown off track by unlikable characters, crappy plotting, and general irrelevance. Part of the appeal of watching movies about rebellious teenagers is that despite whatever self-destructive behavior the characters are engaged in, there's usually a certain measure of vicarious delight in watching them do and say the things you've always wanted to, but were prevented from doing by an overwhelming sense of maturity or restraint. For a movie of this kind to work, the filmmakers have to provide strong, edgy characters that we may not particularly agree with, but can't take our eyes off of when they appear onscreen. In only his second film as a director, Clarence Fok tried to tap into the rebellious spirit of the local youth culture with his 1983 film On the Wrong Track. But in the end, this Hong Kong variation on Rebel Without a Cause is far less compelling than its American predecessor. Fok cast Andy Lau in the lead role of Paul Chen, a young man who has the terrible misfortune of being a member of probably the worst gang of teenage delinquents in Hong Kong cinema history. Led by his baby brother Ah De (Yen Chiu-Hua), these boys go around harassing people while wearing tucked-in polo shirts and short shorts. "Cool" isn't exactly the word that comes to mind when Ah De's gang flexes its puny muscles. That doesn't mean that they're not destructive; the delinquents start off the film with a proverbial bang by blowing up a man's carand for no apparent reason. These young toughs spend the first half of the movie robbing stores, beating people with baseball bats, and getting into regularly scheduled brawls with a gang of equally ridiculous-looking goons. Sadly, when they get together for a rumble, it looks less like a serious gang fight and more like rejects from Michael Jackson's "Beat It" video engaging in a dance-off. The plotor that which passes for onetends to hinge on the characters' home life. Both Paul and Ah De are sons of a strict police officer (Yueh Hua), who's raising the boys alone after their mother left for Taiwan. Both teenagers bring almost daily embarrassment to their father, whose hopes for promotion are always threatened by their criminal behavior. Matters at home aren't helped much by Officer Chen's decision to get married to a younger woman (Chien Hui-Yi of Hong Kong Playboys). Despite her obvious affection and patience with the boys, Paul and Ah De resent her presence, a fact that drives them into further teenage angst and idiocy. The characters are in-and-out of trouble throughout most of the first and second act of the film, eventually causing the elder Chen to consider shipping the boys off to Taiwan. This further angers Paul and Ah De due to the fact that Taiwan demands compulsory military service from its youth. Although Ah De is by far the worst of the two, Officer Chen shuns Paul in favor of his younger son, a move that is, by and large, puzzling. For the most part, Paul just seems to go along with his younger brother's criminal tendencies, voicing his dissenting opinion a few moments before inevitably being convinced by his brother to go along with his dunderheaded plans. Although Paul seems to get the blame from his dad, Ah De is clearly the "mastermind" of their criminal activities. But things start to look up for Paul when he meets Shi (Prudence Liu), a cute-as-a-button Vietnamese refugee who harbors a secret: she's got a kid. Their interactions have scarcely started, but upon learning this secret, Paul suddenly takes their relationship into overdrive, a move that feels rushed on the part of the filmmakers. The sequences of Paul interacting with Shi and her baby are fine and actually a welcome change of pace, but nothing in the narrative prepares the viewer for such a dramatic shift in Paul's attitude toward Shi. Of course, any sort of premarital bliss can't last, as Paul is pulled back into his brother's web of stupidity, a decision that has tragic effects for the Chen family. Midway through the film, Paul finally becomes an out-and-out rebel, eventually getting locked into a strange endgame with his nemesis King Kong (Lau Kwok-Shing), a bald, mustachioed cop who has long been a thorn in the boys' side. After experiencing a series of heartbreaks, Paul decides the best way to resolve his issues with King Kong is to invite the guy to a deserted shopping center and try to run him down with his car. Sounds like logical finale, right? Yeah, I didn't think so either. Although the film is undermined by poor plotting, ridiculous melodrama, and paper-thin characterization, Clarence Fok does display a certain measure of visual panache in On the Wrong Track. The most notable example would have to be the expertly shot demolition derby races that occur from time to time; the sequences have just enough gonzo action in them to make a viewer stand up and take notice. Too bad it's not enough. Overall, On the Wrong Track is visually engaging, but story-wise, it definitely lacks polish. At only twenty one years of age, Andy Lau performs well in what was only his third film role. He doesn't show much range, but one gets the sense that Lau is a real diamond in the rough, surrounded in the film by a host of amateurs (Yueh Hua exempted). Even worse, those "amateurs" are forced to inhabit annoying, irredeemable characters. Ah De and his cohorts are so horribly unappealing and annoying that it's hard to get any charge out of their so-called rebellious behavior. It doesn't help matters that they look like they would be more comfortable on the school's chess team than hanging with Chan Ho-Nam's crew. image courtesy of Intercontinental Video Ltd.